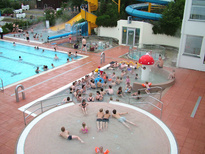 The Akureyri Swimming Pool is one of the most popular attractions in Akureyri. It is open all year round. indoor pool, four hot pots, steam bath, sauna and an extensive area for sunbathing. the hottest hot pot, 42°C. The whole facility is maintained to a high standard. Adjacent to the swimming pool is a very popular family play area. Crazy golf, peddle cars, giant chess set and a playground can be enjoyed by all. This section is open during the summer months. 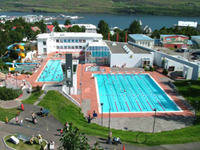 Akureyri swimming pool is one of Iceland's finest. The development of the site is on going with the aim to make it better than ever before for people of all ages. Whether you are a local enjoying the social swimming pool culture of Akureyri or a tourist looking to unwind, Akureyri swimming pool can offer everyone, young and old a space to have fun and relax.